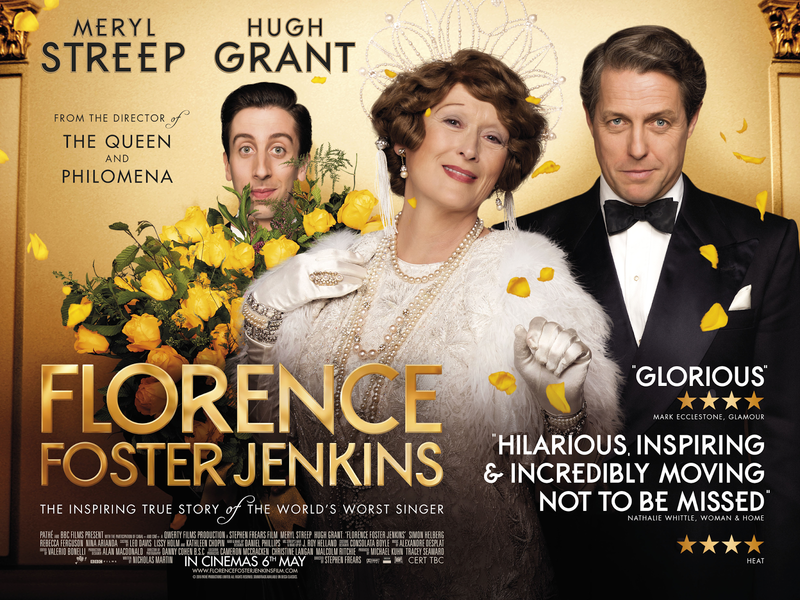 "Florence Foster Jenkins is a 2016 British-French biographical comedy-drama film directed by Stephen Frears and written by Nicholas Martin. The film stars Meryl Streep as Florence Foster Jenkins, a New York heiress who became an opera singer known for her painful lack of singing skill. Other cast members include Hugh Grant, Simon Helberg, Nina Arianda, and Rebecca Ferguson. Filming began in May 2015, and the premiere was held in London on 12 April 2016. The film was released on 6 May 2016 in the United Kingdom, 13 July in France and 12 August in the United States." "Florence Foster Jenkins (Meryl Streep) is a New York City heiress and socialite who founded the Verdi Club to celebrate a passionate love for opera and music. As it is 1944 and the U.S. is in the midst of World War II, Florence is of the opinion that ""music matters more than ever."" English Shakespearean actor, St. Clair Bayfield (Hugh Grant), is her husband and manager. Despite being married, Florence and Bayfield live in separate residences. She has an apartment in the city while he resides in a house with his secret mistress, Kathleen Weatherley (Rebecca Ferguson). Florence suffers from a long-term case of syphilis, which she contracted from her first husband. The illness has caused her to have various health problems and she takes medications that have toxic side effects, such as mercury and arsenic. Due to the fear of passing the disease on to Bayfield, her current marriage is chaste, and Bayfield fulfills his sexual urges with Kathleen. Florence decides to resume her singing lessons, of which she has neglected. She hires pianist Cosmé McMoon (Simon Helberg) and introduces him to her vocal coach, Carlo Edwards (David Haig), the assistant conductor at the Metropolitan Opera. McMoon is shocked to discover that Florence is a terrible singer, yet Bayfield and Edwards pretend she is wonderful, the former giving McMoon a dire warning not to criticize her. Bayfield makes arrangements for a small recital, hand picking people allowed to buy tickets. On the night of the performance, loyal members of the Verdi Club sit respectfully, but others can barely contain their laughter. Feeling encouraged by her recital’s good reviews, she makes a recording of her singing as a Christmas gift for the Verdi Club. Florence gives McMoon a copy of the record, which leads to her recalling how Bayfield wasn't always a very successful actor and she would hide negative reviews to protect his feelings. She also informs McMoon of her history as a piano player and teacher, having once played for the President as a child. McMoon realizes at this moment that Florence is not as musically inept as he had thought, strengthening their friendship. Florence and McMoon write and perform original songs together, one of which gets airtime on the radio, much to the shock and horror of Bayfield and Kathleen, despite many listeners finding much enjoyment from her music, believing it to be comedic. With this burst in popularity, Florence informs Bayfield that she has booked Carnegie Hall for a one night performance and will give away a thousand tickets to soldiers. Bayfield tries to talk her out of it, but fails. With Bayfield stressed over the impending performance, which culminates into him getting into a fight with a group of men listening and laughing at Florence and McMoon's song at a bar, Kathleen cannot put up with the lack of attention and leaves him. McMoon, fearing that the recital will humiliate him to the point of ruining his career, Bayfield tells him that he gave up his acting career to support his wife, and urges McMoon to possibly do the same for the sake of his friend. McMoon agrees, elated that he will at least get to play at Carnegie Hall. The concert is packed and attended by the likes of Cole Porter and Tallulah Bankhead. When Florence begins singing, the soldiers laugh and jeer. Her supporters and loyal friends, however, scold them and then cheer for her to keep singing. She happily continues her performance. Meanwhile, an editor for the New York Post, refuses to continue listening, promising a desperate Bayfield that he will write a damning review of the recital. Bayfield, with McMoon's help, goes to great lengths so that she only receives good reviews by buying every copy of the New York Post in the vicinity and throwing them away. After being given sarcastically patronizing comments about her performance alluding to the New York Post's review by a pair of young men, Florence is driven to find a copy of the review in a trash bin and is upset to the point of collapse. As she is dying in bed, Bayfield by her side, Florence envisions herself dressed as an angel and singing beautiful opera. She imagines that she, McMoon and Bayfield all take a triumphant bow to a standing ovation. She points out proudly that even though people can say she couldn't sing, no one can say she didn't sing. Peacefully, she dies."